$60 monthly for both beginner Belly Dance classes per week with our convenient auto pay feature. Pre registration required. Minimum numbers required for class to be held. Created by Dalia Carrella and Mesmera with a little bit of Janna’s style thrown in for good measure, Gypsy is a fun, playful, variation on Classic Belly Dance style that lets you express your inner Gypsy! Taught at the Intermediate level, students will need to purchase and bring to class a very full dance skirt. Zills are a love/hate relationship. But once you learn to play them and dance at the same time, its all about the love. Janna’s proven method of Belly Dance technique and her one of a kind instruction on how to play Zills will have you in love with your cymbals in now time. 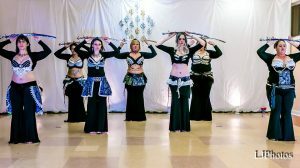 Long Course Zill classes require completion of the 12 week Basic Belly Dance and at least one of the Intermediate Short Course Zill Classes and/or Instructor permission to advance to the Long Course. Veils are beautiful, flowing and like colorful clouds dancing around you and are one of the iconic Belly Dance props for you to fall in love with while you dance. 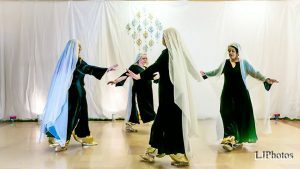 Long Course Veil classes are taught at the intermediate level and require completion of the 12 week Beginner Belly Dance Class and Instructor permission to advance. The class features a fully stages dance that will be performed in the end of the semester Hafla. The Short Course is a 8-12 week long class that will focus on the use of the two most popularly used props in Belly Dance, the Veil and Zills or finger cymbals in a short dance. Rising Intermediates must complete at least 1 short course in the use of the featured prop before advancing to long courses classes. Long Course classes are semester long and focus on more advanced use of the featured prop and fully staged dances that are performed in the end of semester Hafla. Level appropriate costumes are required to dance in the show and are the students responsibility. Don’t worry, we teach how to make costumes too! Must have completed both all 12 weeks of Beginner Belly Dance to advance. The Technique class focuses on movements with the purpose of conditioning, posture, balance, and muscle memory. Class can include cardio, aerobic, and weight bearing exercises, learning free style technique, use of props with your dance as well as center floor and traveling combinations. This is not a performance class. Fusion Classes focus on the joining of Belly Dance with a different style of dance or movement that could include props,floor work, and jumping. Classes focus on a fully staged dance that will be presented at the Hafla. Tribal Fusion is taught at the Intermediate Level and has the same requirements as the Intermediate Zill and Veil courses. The style of Tribal taught is “Urban” Tribal and applies the movements from both Basic Belly Dance, modern dance, hip hop, east Indian, and many other dance styles in a choreography that is performed in the end of semester Hafla. Requires both Intermediate Level Long Courses and Instructor permission to attend. The Advanced class is designed to challenge the dancer and improve technique to the professional level. Class may include Veil, Zills, Folkloric styles, and personal/professional level costumes that are the dancers responsibility. The dance learned in this class is preformed in the end of semester Hafla and other dance performances. PROP CLASS and SUMMER THEMED DANCE In Belly Dance the two most common props are the Veil and Zills. Each has its own class at Janna’s. There are many other lesser known but just as exciting props that can be found in Belly Dance. Session will focus on one or more props and will be used in a fully staged choreography that will be presented in the end of session Hafla. Students are responsible for purchase or making of any props or costumes used in this class. Class slot fees apply. DESERT WIND DANCE COMPANY, DESERT BREEZE DANCE COMPANY, BELEDI BREEZE FOLKLORIC DANCE COMPANY, KAI NOE DANCE COMPANY, AND B.A.S.T. All dance company’s at Janna’s are by invitation only. New participants are notified at the beginning of each semester as to their eligibility. Company members perform at the Halfa, Student Nights, and other dance performances. Our Ballroom dance classes focus on the social side of Ballroom and are taught at the beginner level. Each 4 week session will focus on only one of four styles of ballroom dance: Swing, Fox Trot, Rumba, & Cha-Cha, so that you will be able use what you have learned when the class is finished. Classes move quickly with many combinations broken down and practiced each week. No partner is required but we do not provide one for you! Please wear smooth bottom shoes, try to avoid shoes with rubber soles. One of the most dancer friendly of the couples dance styles! Fun, fast, very usable in dance situations, and great exercise. Club Style Salsa is taught with some 2 step, Merenge, and Mambo thrown in. Our new “mini” format is designed to get you on the dance floor with your partner fast with minimal scheduling problems! Wear comfortable clothes and smooth bottomed shoes.